Redbrush was created a year ago this week with a couple important goals in mind. First, with our wholly author-driven indie-publishing model, we wanted to help authors reclaim the pride and prestige that publishing outside of the traditional model originally represented. Second, we wanted to help indie-publishing authors reach their identified goals and targeted audiences. By helping authors with the second goals, we’ll succeed with the first. Redbrush follows an operating model created by Gino Wickman and described in his book Traction: Get a Grip on Your Business (2011, BenBella Books). Wickman’s built a great model to help business owners and their teams actualize their visions for success by generating the greatest traction as they operate. His Entrepreneurial Operating System (EOS) is a brilliant method for establishing a company’s goals for the future alongside quarterly milestones that provide traction, acting as checkpoints and opportunities for course correction. Redbrush authors can benefit from Wickman’s EOS model as they articulate their vision for their book, brand, and platform, while identifying attainable steps to keep them on track to reach their goals. Here’s a quick view how Wickman’s EOS can be applied by highly-motivated authors. The first step is to describe the Vision you (and your team, if applicable) have for your book and platform. •	What are the three most basic values that describe your mission? •	How would you break down these similar values to the shortest form? •	What is your book’s purpose and niche? •	What is the niche or unique mission that you want to own with your project and platform? Think of the most amazing goal for your book; that pie-in-the-sky result that would exceed your wildest dreams. Name it. Claim it. Go for it! •	State your Guarantee—What is the unique guarantee that you pledge to your readers? Imagine taking a snapshot in three years. What does it look like? These should be measurable milestones reached (books sold, speaking engagements held, revenue/sales generated, etc. ), or describe general activities achieved (participation in a national association, being featured at a national conference, called upon by media as an expert, etc.). Try to come up with five to ten items. The Traction part of the process is all about your short-term goals. Forecast some attainable goals for the next twelve months. List no more than five to seven. These can be items from your organizational to-do list, goals that help you jumpstart toward your three-year picture, and forecasted sales, revenue, and other measurables. These are big picture items that keep you on track with your overall focus and marketing strategy. Wickman calls these milestones “Company ‘Rocks’,” after the highly effect business habits of the Rockefellers. Think of them as quarterly milestones to target and complete. Pick five to seven of these, too. Sometimes, less is more. It’s better to keep your goals reachable by choosing a smaller number of them, than overloading yourself with too many tasks. These might include the number of new visitors to your Website, number of books sold through retail orders, and the number of press releases sent to media contacts. Again, Wickman uses the term “Rocks” to describe these personal, quarterly goals. Five to seven is enough to keep one busy for three months. Choose items that move you closer to your One-Year Plan. These will be the personal plans and goal setting that you do for yourself. These should be measurable, and include activities that can be quantified as clearly completed or not completed. The number of follow up contacts one’s made to media people who replied to a social media campaign, the number of books you’ve sold directly through your Website, and the number of blog posts that you’ve done during the quarter are good examples of personal, Author Milestones. No great system will work well if it doesn’t become a habit or routine. Gino Wickman details in Traction; Get a Grip on Your Business, how to create a meeting schedule with one’s business teams to help everyone remain accountable and maintain traction toward the stated vision and goals. As an author and team of one (or two or more, if you have a team of family or colleagues helping), it’s vital to keep your quarterly milestones posted prominently in your office or workspace, so that you can constantly self-check your progress and be prompted to keep working toward your own goals, and those of your brand/platform. Indie-publishing authors already tend to be spirited and highly-motivated. Any tool that helps them better articulate their goals and identify their target audiences, is a good one to consider for the workshop. 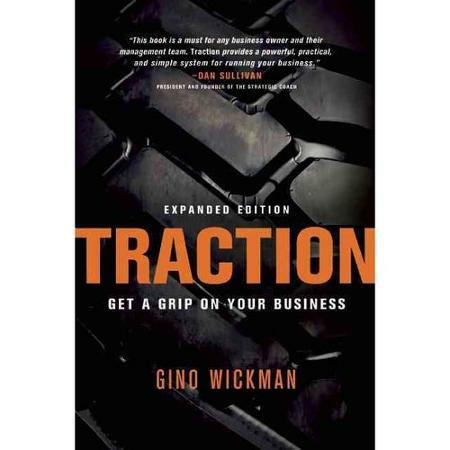 Gino Wickman’s book Traction; Get a Grip on Your Business, possesses insights and exercises that help business owners divine their unique vision and gain traction for their company, brand, and platform. Wickman’s ideas are easily applied to indie-publishing authors. Writers desiring to fine tune their vision and achieve better traction in the marketplace will benefit from the expert publishing services offered by Redbrush and the processes we offer.